"Mad" Anthony Wayne (January 1, 1745 - December 15, 1796), was a United States Army general and statesman. 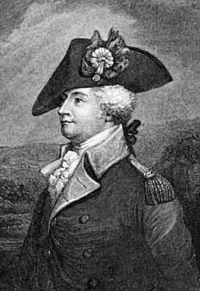 Wayne adopted a military career at the outset of the American Revolutionary War, where his military exploits and fiery personality quickly earned him a promotion to the rank of brigadier general and the sobriquet of "Mad Anthony." Wayne was born in Chester County, Pennsylvania. He attended his uncle's private academy in Philadelphia. Then he spent a year as a surveyor in Nova Scotia and worked in his father's tannery. In 1775, he served in the provincial assembly. The following year, he joined the Continental Army's unsuccessful invasion of Canada, during which he commanded the distressed forces at Fort Ticonderoga. Later, he commanded the Pennsylvania line at Brandywine, Paoli, and Germantown. After winter quarters at Valley Forge, he led the American attack at the Battle of Monmouth. On the Hudson River, he captured the British garrison at Stony Point, for which Congress awarded him a medal. 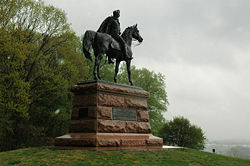 Victories at West Point and Green Spring, Virginia, increased his popular reputation as a bold commander. After the British surrendered at Yorktown, he went further south and severed the British alliance with Native American tribes in Georgia. He then negotiated peace treaties with both the Creek and the Cherokee, for which Georgia rewarded him with the gift of a large rice plantation. After the war, Wayne returned to Pennsylvania. He served in the state legislature for a year. Later, he supported the new federal Constitution at Pennsylvania's ratifying convention. In 1791, he spent a year in Congress as a representative of Georgia, but lost his seat during a debate over his residency qualifications. President George Washington then placed him in command of the army opposing Native American tribes in the Ohio Valley. In 1794, he defeated Little Turtle's Miami forces at Fallen Timbers near present day Toledo. Wayne died on December 15, 1796, during a return trip to Pennsylvania from a military post in Detroit. Wayne was born to Isaac Wayne in Easttown Township, Pennsylvania, in Chester County, near present-day Paoli, Pennsylvania, and educated as a surveyor at his uncle's private academy in Philadelphia. He was sent by Benjamin Franklin and some associates to work for a year surveying land they owned in Nova Scotia, after which he returned to work in his father's tannery, while continuing his surveying. He became a leader in Chester County and served in the Pennsylvania legislature in 1774-1780. At the onset of the war in 1775, Wayne raised a militia and, in 1776, became colonel of the Fourth Regiment of Pennsylvania troops. He and his regiment were part of the Continental Army's unsuccessful invasion of Canada, during which he commanded the distressed forces at Fort Ticonderoga. 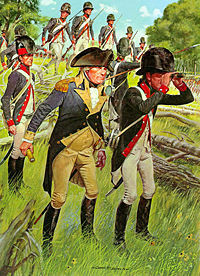 His service resulted in his promotion to brigadier general on February 21, 1777. The highlight of Wayne's Revolutionary War service was his victory at Stony Point. On July 15, 1779, in a nighttime, bayonets-only assault lasting thirty minutes, light infantry commanded by Wayne overcame British fortifications at Stony Point, a cliffside redoubt commanding the southern Hudson River. The success of this operation provided a boost to the morale of an army which had at that time suffered a series of military defeats. Congress awarded him a medal for the victory. After the war, Wayne returned to Pennsylvania, and served in the state legislature for a year in 1784. He then moved to Georgia and settled upon the tract of land granted him by that state for his military service. He was a delegate to the state convention which ratified the Constitution in 1788. In 1791, he served a year in the Second United States Congress as a U.S. Representative of Georgia, but lost his seat during a debate over his residency qualifications and declined running for re-election in 1792. President George Washington recalled Wayne from civilian life in order to lead an expedition in the Northwest Indian War, which up to that point had been a disaster for the United States. Many American Indians in the Northwest Territory had sided with the British in the Revolutionary War. In the Treaty of Paris (1783) that had ended the conflict, the British had ceded this land to the United States. The Indians, however, had not been consulted, and resisted annexation of the area by the United States. A confederation of Miami, Shawnee, Delaware (Lenape), and Wyandot Indians achieved major victories over U.S. forces in 1790 and 1791, under the leadership of Blue Jacket of the Shawnees and Little Turtle of the Miamis. They were encouraged (and supplied) by the British, who had refused to evacuate British fortifications in the region, as called for in the Treaty of Paris. Washington placed Wayne in command of a newly-formed military force called the "Legion of the United States." Wayne established a basic training facility at Legionville to prepare professional soldiers for his force. He then dispatched a force to Ohio to establish Fort Recovery as a base of operations. Chief Little Turtle, presumed leader of the Native American coalition, warned that General Wayne "never sleeps" and that defeat by him was inevitable. He counseled negotiation rather than battle. Perhaps for this reason, Blue Jacket was chosen to lead the Native warriors in battle. On August 20, 1794, Wayne mounted an assault on Blue Jacket's confederacy at the Battle of Fallen Timbers, in modern Maumee, Ohio (just south of present-day Toledo), which was a decisive victory for the U.S. forces, ending the war. Although a relatively small skirmish, many warriors were disheartened and abandoned the camp. Soon after, the British abandoned their Northwest Territory forts in the Jay Treaty. Wayne then negotiated the Treaty of Greenville between the tribal confederacy and the United States, which was signed on August 3, 1795. Wayne died of complications from gout during a return trip to Pennsylvania from a military post in Detroit, and was buried at Fort Presque Isle (now Erie, Pennsylvania). His body was disinterred in 1809, and was relocated to the family plot in St. David’s Episcopal Church Cemetery in Radnor, Pennsylvania by his son at the request of his dying sister. A legend says that many of his bones were lost along the roadway that encompasses much of modern PA-322, and that every January first (Wayne's birthday), his ghost wanders the highway searching for his lost bones. Wayne's was the first attempt to provide formalized basic training for regular Army recruits and Legionville was the first facility established expressly for this purpose. The Treaty of Greenville was procured due to Wayne's military successes against the tribal confederacy, giving most of what is now Ohio to the United States, and clearing the way for that state to enter the Union in 1803. Although it is often attributed to his recklessness and daring in battle, General Wayne received the nickname "Mad Anthony" because he was struck in the skull by a musket ball during the Battle of Stony Point in 1779. Military surgeon Absalom Baird removed the broken fragmants of his skull and replaced them with a steel plate in an operation called a cranioplasty which was pioneered by Meekeren in the seventeenth century. A side effect of the operation was occasional epileptic-like seizures which would cause Wayne to fall on the ground and foam at the mouth: Hence the nickname. There are many political jurisdictions and institutions named after Wayne, especially in Ohio, Michigan, and Indiana, the region where he fought many of his battles. A small sample: Wayne counties in Kentucky, Pennsylvania, Georgia, Illinois, Indiana, Michigan, Missouri, Nebraska, North Carolina, New York, Ohio, and West Virginia; the towns of Waynesville, North Carolina and Waynesville, Missouri; the cities of Waynesboro (Georgia), Fort Wayne (Indiana), Wayne (Michigan), Wayne (Nebraska), Waynesboro (Virginia), Waynesburg (Pennsylvania), and Waynesboro (Pennsylvania); the villages of Waynesfield, Ohio, and Wayne, Illinois; the community of Wayne, Pennsylvania; Wayne Township, New Jersey; the Mad River, a tributary of the Great Miami River in Dayton, Ohio; and Wayne National Forest in Ohio. Actor Marion Robert Morrison was initially given the stage name of Anthony Wayne, after the general, by Raoul Walsh, who directed The Big Trail (1930), but Fox Studios changed it to John Wayne, instead. Comic book writer Bill Finger named Batman's alter ego, Bruce Wayne, after the general. In some versions of the comic book, Gen. Wayne is depicted as Bruce's ancestor. The Gen. "Mad" Anthony Wayne, a side-wheel steamboat, sank in April 1850, in Lake Erie, while en route from the Toledo area to Buffalo, New York, killing 38 out of 93 passengers and crew on board. Maumee Valley Heritage Corridor www.maumeevalleyheritagecorridor.org. This page was last modified on 21 November 2016, at 15:33.